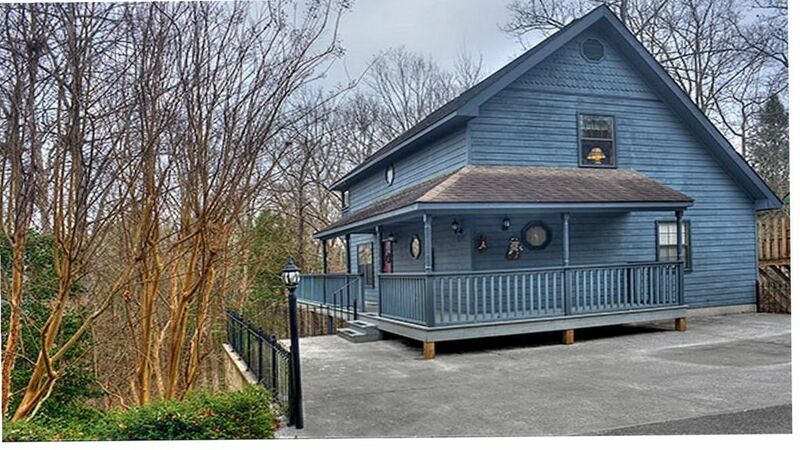 Three Bedroom Chalet close to all the Action in Pigeon Forge! Three bedroom, three bathroom Chalet located in Woodridge Village Resort in Pigeon Forge, TN. Relax on one of the three decks and enjoy the peaceful wooded view. Dove's Cove is spacious and airy. The free community swimming pool is just a very short walk around the corner. Grill out on the gas grill. Pool table, board games, blue ray player and TV's in every room provide entertainment for the nights you decide to stay in. The kitchen is well equipped with everything you would need to cook up dinner or snack. Full set of pans, utensils, dishes and tableware are provided. Other appliances include a toaster, Mr. Coffee coffee maker, electric griddle, and crock pot. Each bedroom has a TV. The master bedroom contains a jacuzzi and sky light. King size bed with comfortable bedding. Master bath off the bedroom has a combination shower/tub. Ceiling fans circulate the central air conditioning. The other two bedrooms contain a queen bed and TV. There are two twin beds in the loft area. The main room features a stacked stone fireplace. Free WiFi is included as well as Comcast TV service. Blu Ray player and stereo system complete the entertainment package.Great location! Only 1 mile from the Parkway and minutes from all of the area attractions! Spacious 3 bedroom chalet offers 3 levels each with a bedroom and bathroom. As you walk into the home you are immediately welcomed by the open kitchen, living room, and dining area. The living room is prefect for grabbing a bag of popcorn and enjoying a movie in front of the stone stacked gas fireplace on those chilly nights in. A Queen size bedroom and large bathroom are located on this level as well. Upstairs you will find the master King bedroom with a large romantic jacuzzi tub and a full bathroom. Travel to the lower level and you find the game room where you can challenge someone to a friendly game of pool or hang out in the second sitting area with a TV and wet bar. A Queen bedroom and bath are located just down the hall. Two large open decks to sit & relax OR swing your cares away. Rick and Roberta Howard live in northwest Ohio and are semi-retired business people. They spend their free time in the mountains of eastern Tennessee. Their favorite activities are visiting the Smoky Mountain National Park, seeing the shows at Dollywood and dining at the many restaurants in the area. We already own Eagles Rest Chalet (VRBO #3842497) just around the corner from this chalet, so we know the area and how this chalet was built. We would only consider renting a property that we ourselves would enjoy, and Dove's Cove Chalet fits the bill! It is conveniently located to all the attractions, easy to find and very comfortable! In 2017: All new carpet, new washer and dryer, new gas grill, two new twin beds and mattresses, new bedding and towels. Especially love the light airy atmosphere of this chalet. Most of the properties in this area are very "woodsy" and that is fine, but it is refreshing to stay at Dove's Cove Chalet where you get lots of light. Central Air, ceiling fans in every room. Three levels of decks, lots of room to sit out and enjoy the scenery. Doves Cove is not especially set up for handicap accessibility however Main floor would be suitable for limited mobility. Only three small steps onto porch to get into chalet. There is a bedroom and bathroom on main floor. The main floor also has the kitchen, dining area, and living room. Also easy access to deck off living room. The upper and lower level are accessible by a regular stairway and could be challenging for mobility impaired individuals. The main floor would be o.k. though. The tub is a step in tub. We had a wonderful stay in Pigeon Forge. The cabin was great for a family and five grandchildren. We hope to come back and stay at the cabin again in the near future. This is a nice cabin at a very convenient location. The owners have done a good job at starting to update the inside and they probably will continue when they can. The living room had a nice fireplace, but the couches are older and kind of hard to get out of; at least for an older person. The kitchen was well equipped. The dining table and chairs were great for our group, even for games. Overall this was a very good place for a large family or up to four couples(beds for eight). There are three bathrooms of which one is upstairs where two single beds in the loft would share the upstairs bathroom. The water pressure and hot water were great for our group. Thank you for your review ,I'm glad you had a nice stay! You are right, we are constantly upgrading your family was the first to stay in Doves Cove after we put down new flooring and wall paneling. Thanks again! We had a great time. The cabin was so close to everything in Pigeon Forge and Gatlinburg. The cabin was spacious and everyone enjoy the game room. I heard so many horror stories about cabin driveways and this one was fine. Parking was fine. The place was AWESOME. The layout of the house is very useful for multiple guests. The house is in desperate need of a cosmetic update. Remove old wallpaper, repaint update furniture and please please get new mattresses! Kitchen was okay but there was absolutely no storage available for even the most elementary supplies or groceries. Hot tub was nice after we called to get it serviced. Was very dirty when we arrived. Can't say much for the view or the parking. This was the first time staying in a cabin, and it will definitely not be our last. We take my mother n law on trips with us, and this was a way to stay together, but still be able to spread out and enjoy each other as well. I loved being away from all of the traffic but really easy and fast to get to the parkway. Our favorite place was the basement/ game room. This is the most relaxing vacation that my family has ever been on. Thank you for allowing us to make great memories at your chalet. Cant wait for next year!!! Just as it was described, the house was located close to lots of entertainment while also being in a quiet and secluded area. There was lots of room for us to gather together, but the three levels also gave us a chance to have some private time. The house was clean enough for us, but a few areas, such as the porch, could use a good cleaning. The pool area was nice and rarely busy. I would have liked a place to recycle. We were told that the high school had a place, but it only took paper. Rates are subject to change until booking is made. Check In is 4:00 p.m. Early arrivals may not be able to access Doves Cove Chalet, depending on cleaning schedule. Check Out is 10:30 a.m. Cleaning staff will be arriving to clean for next arrival. Please no smoking or pets.